By The Chas Fischer Spring Co. 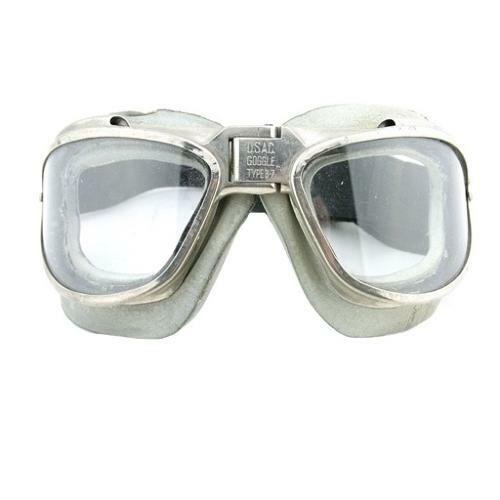 US Army Air Corps type B-7 flying goggles. Excellent nickel plated brass frames with integral 'streamlined' vents. Stamped 'USAC Goggle, Type B-7' on the centre hinge. Fitted with an excellent set of American Optical clear glass lenses and the correct two-piece sponge rubber face cushions. These remain flexible and are generally in good shape but do have some surface cracks and indentations. The original strap is a little stretched but retains some elasticity. A good '+' pair of these rarer early wartime goggles. Stock code G22920.